The Hamarain Center (Hamriyan, Hamarayan, Hamariyan) is a medium sized shopping mall on 3 floors, and office complex on the 4th and 5th floors, in Deira, Dubai, next to the JW Marriott Hotel. Hamrain Center opening date was 1992. Covered basement parking available after 1700 (5pm) only, daytime access for cardholders. Marriot Hamrain Center free parking building across the road (usually full during the day). Tel +971-4-2621110, fax +971-4-2626004, email hc2621110@emirates.net.ae. Postal address: Hamarain Center, PO Box 16739, Dubai, UAE. Hamarain Center location is on the Abu Baker Al Siddique Road in the Al Muraqqabat area (from Bur Dubai go over the Maktoum Bridge and under the Clock Tower roundabout, but not in direction of Baniyas St or Deira Corniche). There is (or was) reportedly a legal dispute between the Burisly / Bu Risli family of Kuwait, and the Hamarain family of the UAE. The dispute centers around the ownership and partnership of the Hamarain Center and JW Mariott hotel starting with the Burisly family filing suit against the Hamarain family in 1998 over an ownership contract which said the split was 80% Bu Risli vs 20% Hamarain. The Hamarains disputed the contract as being forged. The Dubai Commercial Court of Appeals ruled in favor of the Burisly family in 2001, ordered the dispute to be reviewed by the Dubai Rulers Court, and named an interim manager in November 2009 in a judicial guardianship order. On 30 May 2010 (adjourned from 09 May 2010), the Dubai Court of Cassation lifted the judicial guardianship order of the Dubai Commercial Court of Appeals, which means the center is back to being run by the Hamarains. Court records show that rent from the shopping centre is worth AED 1.8 billion since it opened in 1992, and the value of the centre and hotel together is about AED 4 billion. Information based on Emirates Business 24-7 news reports 10 & 31 May 2010. Last update Wednesday 06-Oct-2010. Page development 1H 2T 3D 4L 5C. 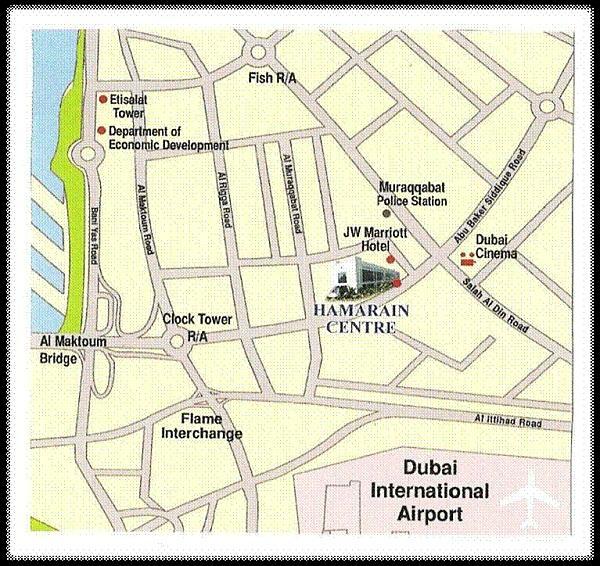 www.dubaifaqs.com/hamarain-center.php (PDF and print version).